You finally want to sleep right and may even want to control your dreams? Then have we got the app for you. 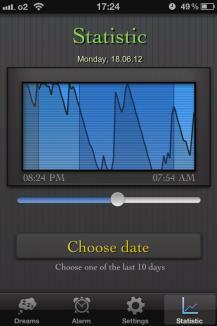 This app makes it possible to control your dreams and monitor your sleep cycle. Using the iPhone's built-in sensors, it's possible to track your every movement during sleep and create your personal sleeping profile. Just place the iPhone on your bed for a few nights, so it can create your sleeping profile and find the perfect time for dream control. As soon as that moment is reached, Dream Control will play sounds you picked before and your subconscious will react. By picking different sounds, you can decide what you want to dream about. But this app does more. It also functions as a sleep phase alarm, which wakes you up from a dream you pick. 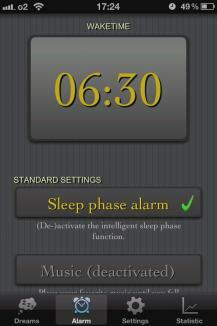 No more waking up from deep sleep, since this app makes sure to wait for your lightest sleep to wake you up. 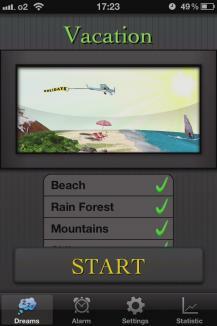 Dream Control is very user-friendly, so every dream can be individually adjusted. Plus, you get a personal sleep-analysis every morning. The built-in music player helps you fall asleep and shuts off automatically once you're sleeping. The alarm-clock features various new sounds if you don't want to use your own. Whatever you want to do, with Dream Control you have two apps in one. 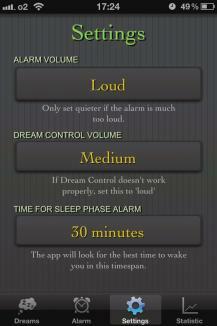 Dream Control and sleep phase alarm for a wonderfully relaxing sleep.